If you’ve considered purchasing an RV, then you’re certainly not alone. RV ownership is on the rise across the United States. The number of people who own RVs is at an all-time high—there has been a 64 percent increase in RV ownership since 1980. The number of RV shipments made has also continued to climb, with an astonishing 430,691 units shipped in 2016 alone. There are many reasons people find the RV-vacation lifestyle so attractive. Being able to travel as frequently as you like and with very little forward planning is a big draw. So is having the comforts of home at your fingertips no matter what your location. Another less commonly understood benefit to RV vacations is the positive impact they have on your health. Here are four ways that RV vacations can positively benefit your health and well-being. Traditional vacations generally involve a hotel stay, which likely won’t provide you with self-catering facilities. This means you’ll be reliant on restaurants for most, if not all, of your daily meals. Not only is this bad for your wallet, but it’s also bad for your waistline. Around 61 percent of people gain an average of 0.7 pounds during a vacation. However, RV vacations seem to buck this trend. The fully equipped kitchens in RVs mean you can prepare your own meals using fresh and healthy ingredients. When you have a kitchen, you’ll be less likely to blow your diet by eating rich restaurant meals with unhealthy portion sizes or to opt for a quick and cheap but unhealthy fast-food meal while you’re on the road. A majority of RV owners report that enjoying the great outdoors and getting back to nature are some of the main reasons they love RV vacations. Some of the most popular campsites and RV sites around the country are found near national parks and areas of great natural beauty. Traveling to locations such as this in your RV provides a more active and healthy vacation experience. Hiking, swimming, outdoor sports, and other active leisure pastimes all go hand in hand with RV vacations. Science has shown how vital regular vacations are for good physical health. People who take regular holidays benefit from reduced stress levels, a decreased risk of developing heart disease, and a significant improvement in sleep quality. Owning an RV gives you the freedom to have many short vacations over the course of a year. On a long weekend, you can simply take your family to a campsite within a few hours of your home. More than 90 percent of RV owners take advantage of this option, going on three or more mini-vacations each year. This frequency is possible because RV vacations are inexpensive compared to other vacation types—even when you factor in fuel, campsite, and RV-purchase costs. As a fun option that improves your health without breaking the bank, an RV vacation is a great choice. There is a growing awareness about mental-health issues in the US and a deeper understanding of how they impact a person’s health in general. Too much stress can negatively impact physiological health, causing migraines, spinal and muscular pain, and heart problems. The time you spend outdoors can also help to prevent or alleviate mental-health issues like depression. The social aspect of RV vacations is also beneficial for emotional health and well-being. 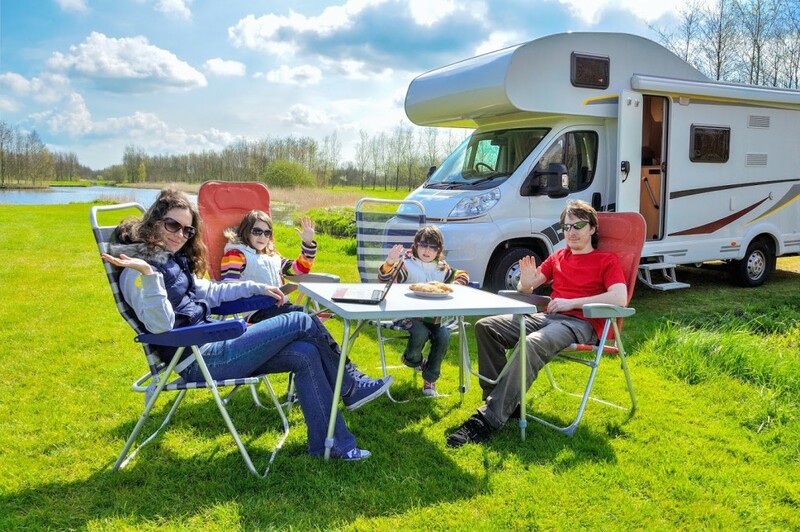 Spending quality time bonding with friends and family is a highly valued aspect of RV vacations and has positive benefits for the whole family. Children in particular benefit from this bonding time spent with parents away from the stresses and distractions of everyday life. As a whole, RV owners are a very social group, and it’s common to meet and befriend a wide range of different people during your vacations. Interacting with your fellow campers can help reduce or prevent depression, boost your feelings of well-being, and boost your self-esteem. These social interactions can even stave off dementia and increase your life expectancy. Buying an RV isn’t simply buying a vehicle. When you become an RV owner, you’re buying into a lifestyle that is celebrated and loved by an ever-increasing number of people. Buying an RV is embracing freedom, a healthier lifestyle, and a wonderful way to see the many amazing destinations the country has to offer. Contact the friendly and helpful team at Fretz RV in Souderton to find out about purchasing your new RV. We have an extensive range of new and used RVs available at our dealership, which is one of the largest in the tri-state area. You can rest assured that our knowledge and experience will help you to find an affordable RV that will suit all of your requirements for features, size, and style.